iOS 5 and OSx (Mountain Lion or later) have ‘Reminders’. I figured that it must be possible to show Tasks from Exchange – after all, I could already sync Email and Calendars. So I set this up … and no tasks came through. Puzzling. Instead, I tried the opposite – to create an Exchange Task from iOS. 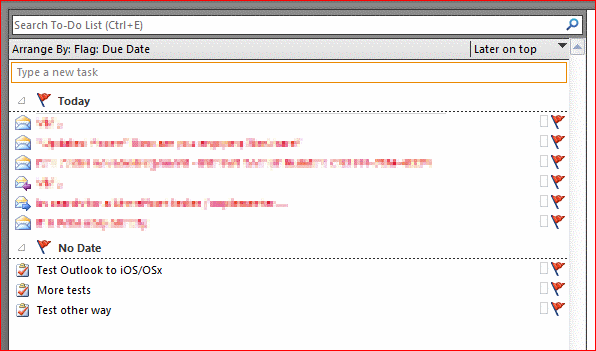 I created a ‘Task’ item in Outlook and voila, it appeared on my phone (as you can see in the screenshot of my phone). Further checking shows that when you flag an item for ‘Follow Up’, it creates a ‘To Do’ item. 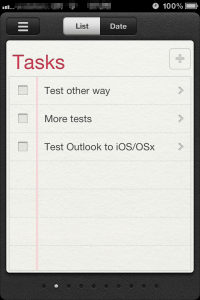 This is not the same as a Task, and isn’t synced with iOS or Mac OSx Reminders. It’s kinda hard to say who missed the point here – Microsoft or Apple – but it is pretty annoying that an email flagged for follow up can’t be synced with Reminders. This might be worth remembering if considering Office 365 / iPad or iPhone scenarios. You have just discovered what is actually a very common and frustrating issue. I first ran into it last year. There are lots of Apple Forum and etc.. posts everywhere with folks complaining about this. I am a big flag email for followup fan and I really wanted the ability to track my normal tasks and flagged email from an iOS device. I finally found an app (TaskTask) in the app store that can synch both normal tasks & follow-up flagged mail items. I just bought it a few weeks ago and so far so good it seems to work very well and finally I have one unified task list. Thanks Kyle, good to know. I hope someone at Apple – or MS, whichever is the issue – decides to do something about it. I wouldn’t count on it though, so I might look at TaskTask. It just seems a shame that Apple thought about it for Reminders, but then stopped short of the ToDo items. Now you’ll have a task that will sync with any of the task apps, including the native reminders app. @Colin – Thanks for your great suggestion! Worked perfectly for me and the QuickStep was already their when I right clicked. I will do that from now on instead on flagging the emails. The best thing about this suggestion is that there is nothing new to install and configure on iOS – stock tools will support this method.